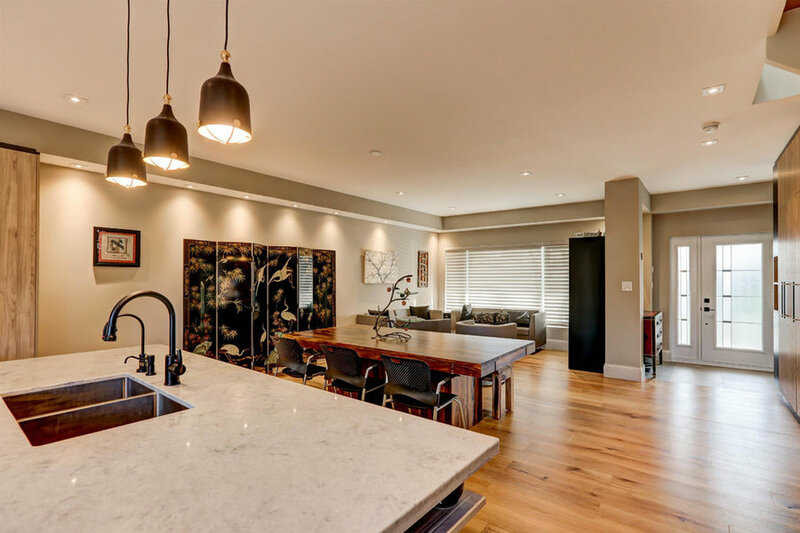 The clients love to host dinners and events but with a family of 5 and ample extended family, their home could feel crowded with it's separate living, dining and kitchen space. It was time to open it up! A previous renovation had meant that not only could the walls be removed, but the ceiling of the main floor could be raised by almost 1 foot. 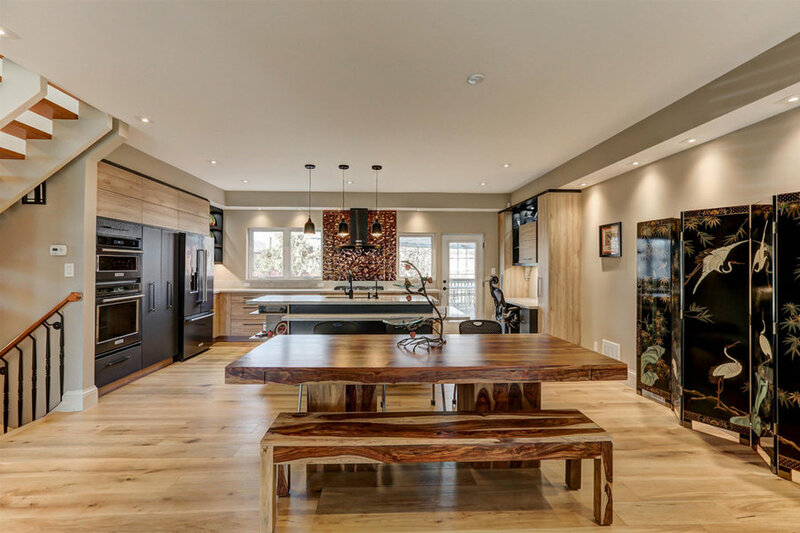 Warm, earthly tones create a unified and comfortable space where the clients now have ample space to entertain. 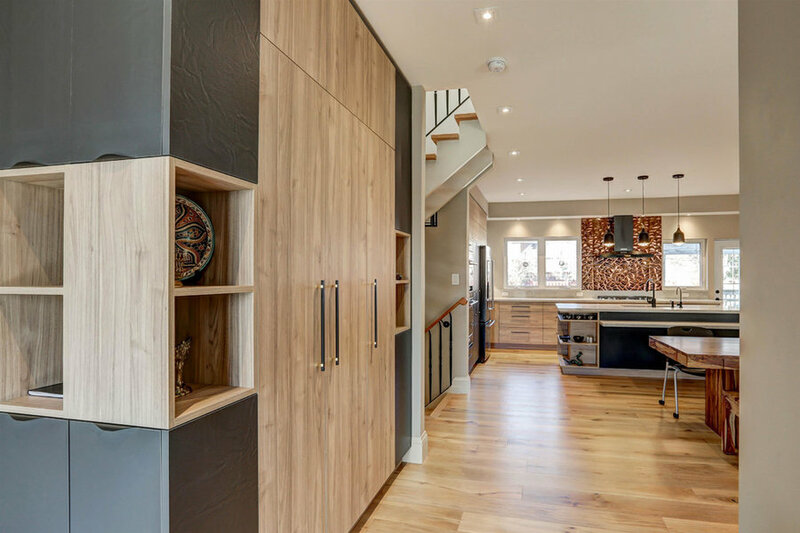 In order to accommodate a busy and thriving family of five, custom storage space was designed that maintained the open concept of the mainfloor while creating a place for everything. The closet space is tall enough for double lineal hanging storage while cupboards for shoes and gear flank the sides. Niches for the families keepsakes were included in the design, to ensure that it's not only functional, but a beautiful storage space as well. By adding height to the ceiling and removing the partition walls, what was once a disjointed and disconnected living space is now cohesive and coherent. Where once was a double sliding glass door, a single door now leads to the clients large patio and backyard. By removing this door and adding a window instead, the kitchen counter could be extended while still allowing natural light to fill the space. The clients beautiful Chinese screen unites the space more than it divides it. 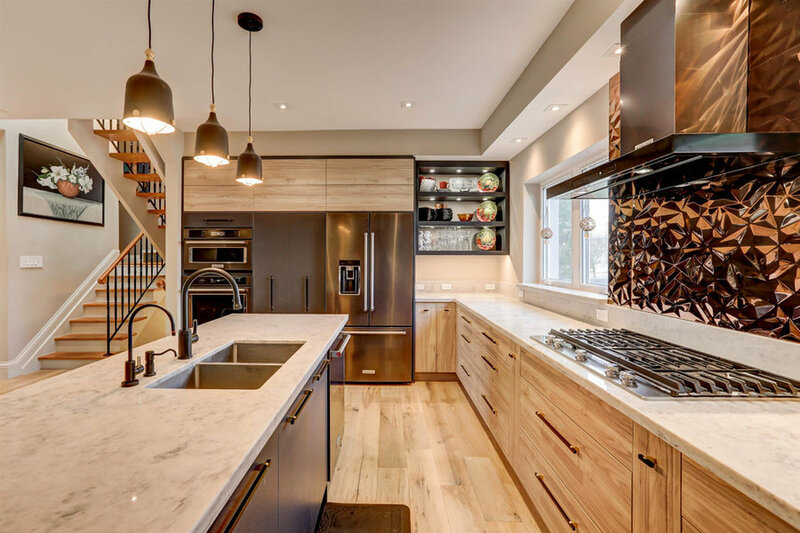 In order to tie in the dark laquered screen and natural scene, earthy materials such as natural wood were implemented as well as a dark finish on the kitchen island, custom hardware and desk bookshelves. This ensures this beautiful statement piece doesn't speak too loudly and is, instead, tied into the rest of the space. The kitchen island has been designed with a floating shelf that's not only ideal for food prep and acts as a buffet, but also doubles as a space for the kids to do homework. 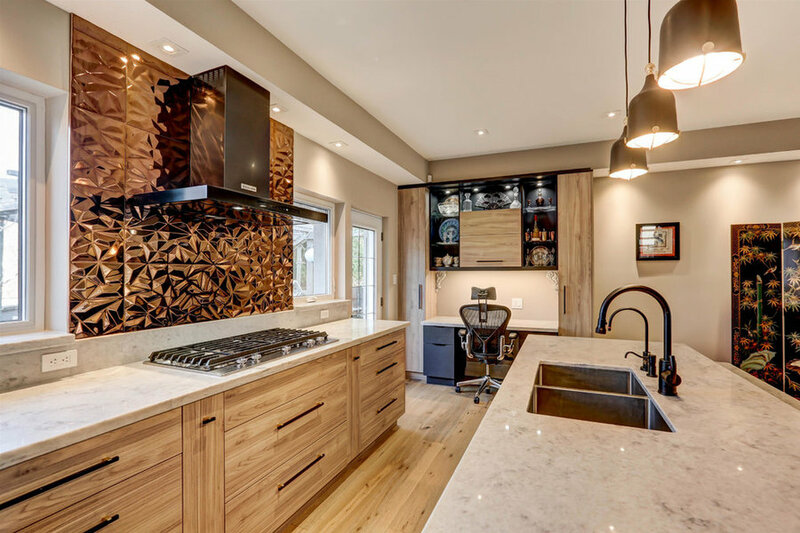 Electrical and data outlets were included in the design to ensure any task could be completed there.As well, display niches were added in every corner to help the family display a lifetime of memories and mementos without sacrificing storage space. 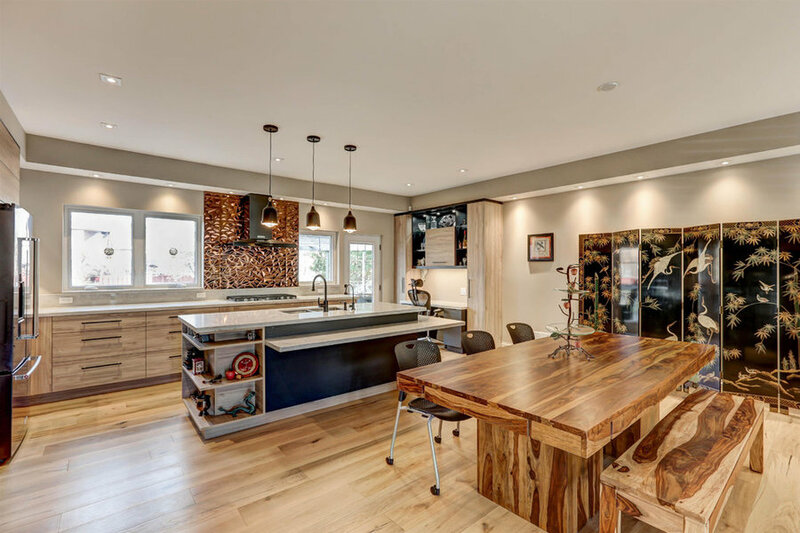 With the partition walls now removed, sight lines extend all the way through the space, creating unity between the different areas, whether it's just the kids doing homework at the kitchen island or guests are arriving for a family dinner. 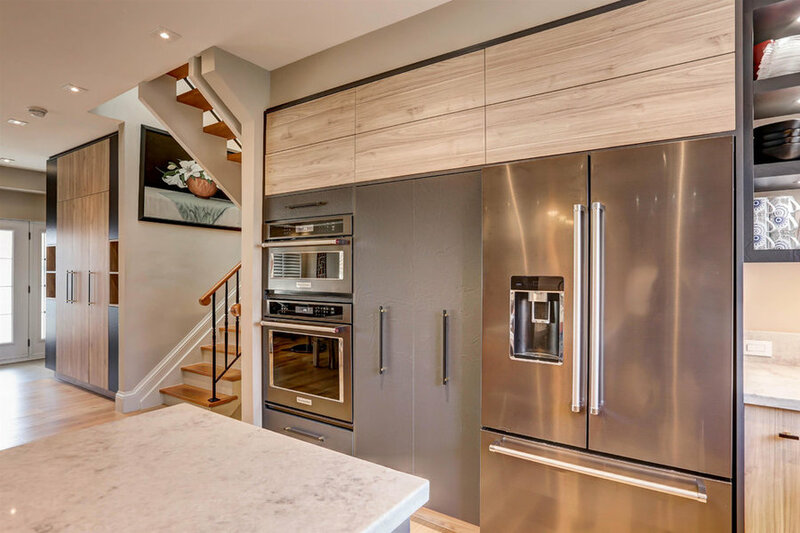 To better highlight the now taller and longer living space, articulated vertical and horizontal lines are repeated through out the space, especially using the custom cabinets. A muted and sophisticated colour palette let's the materials speak for themselves. The faceted bronze tile backsplash adds a lustrous texture to the kitchen without distracting from the subtle refinement of the custom bronze and black drawer pulls and the black plumbing fixtures. The extra-wide drawers act as storage for all the clients kitchen accessories, making storage not only plentiful but convenient. 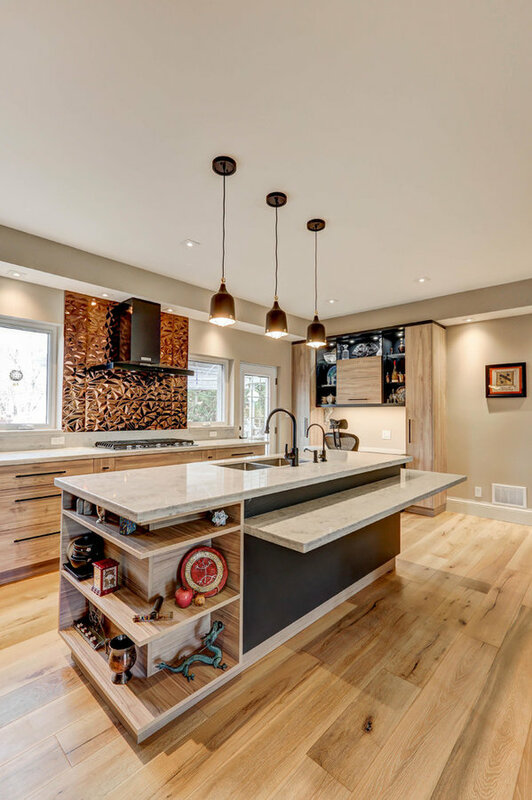 By opening up the space, the kitchen is now almost twice as large while allowing for the clients to interact with their guests when they entertain. The natural light and abundance of natural materials creates a welcoming and comforting space.